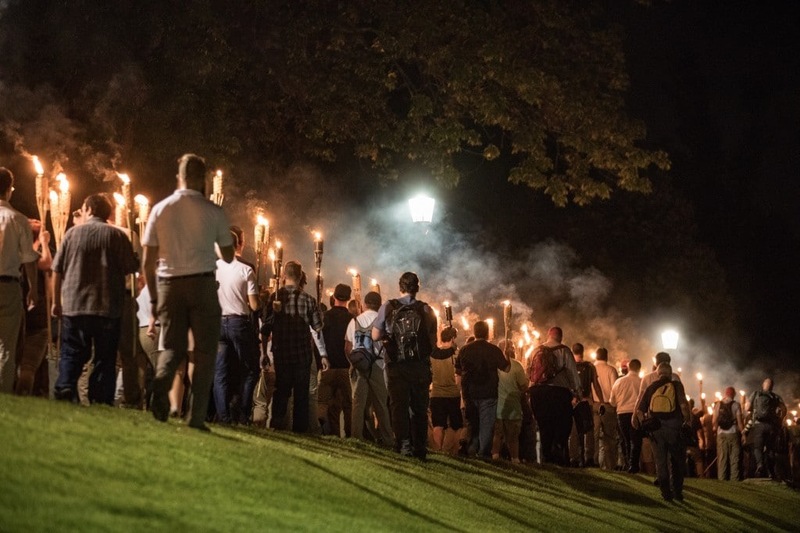 Like nearly everyone else I know, I’m struggling to get my mind around what’s happened in Charlottesville over the past 24 hours beginning with the surreal tiki-torch march last night through the malicious attack on counter-protestors that left one person dead. 1. The sight of a parade of white nationalists marching to the University of Virginia chanting racial and ethnic epithets let us know that this was far from normal, that something is very broken in our social fabric. Even though Jefferson had his blind spots on slavery that we can’t ignore, the entire march seems the antithesis of what he envisioned when founding UVA. Clearly, the nationalists have a guarantee of first amendment protections (championed by the VA ACLU) but we can celebrate their right to protest without legitimizing their views. 2. The presence of armed militia today was especially unnerving, especially during the time where there seemed to be confusion as to whether these were guardsmen or militias. Their presence appeared not just to celebrate open carry rights but to make tangible the potential for violence. 3. I found cable news today to be singularly unhelpful in trying to see what was going on. I spent time with MSNBC, CNN, and Fox News (actually a few minutes each was all I could stand). All of them had their standard panels that divided into partisan camps and tried to link everything to all things Trump. The conversation drifted from events on the ground to North Korea to Mueller to wondering why POTUS hadn’t said anything yet (it was better when he didn’t). Fox managed to do a better job with events on the ground but I gave up when the host described “differences of opinion” about Confederate statues. To be realistic, these marchers weren’t talking about why a statue was important to heritage; they were talking about a different kind of nation altogether. 4. The whole question of Trump Voters support the Alt-right seemed to be particularly problematic. To make such overgeneralizations had the predictable effect of making this a partisan conversation. It is true that Trump, like others before him, used awfully loud dog-whistles and continues to do so. But not everyone concerned about border security was carrying tiki torches. It’s important to isolate these bad actors and not link them to politicians or law enforcement. There are issues with both of those, but the nationalists deserve their own special approbrium. 5. Social media played a very strange role in the events. On the one hand, it was the only way I could keep up with what was going on. But too many reposts were from earlier events, so I knew stuff was happening but not exactly what. Social media was also present at the events. I was amazed at how many videos from this morning showed people taking video or describing events to their friends. 6. There is far too much “both-sidism” in situations like Charlottesville. We’re there angry worlds and gestures from counter-protestors? Yes. Did they instigate conflict? Certainly not. There are no parallels between Black Lives Matter and those White Nationalists who confronted them. BLM activists do not wish that White People should not be in the country. The early intimidation, threats of violence, and the eventual car attack stand apart from anything the counter-protestors were doing. To argue otherwise is blind at best and malicious at worst. 7. Everyone, from Trump to local ministers to Boy Scout leaders, should know that we simply and clearly denounce White Nationalist attitudes and behavior. To not do so is at the heart of what researchers are talking about when they try to explain implicit bias (that one’s for you, Pence). For all the times conservatives have misappropriated MLK’s Dream speech, this is one time where it makes sense: “the content of their character” deserved to be judged and judged harshly.